McDonald’s, Wendy’s, and Walmart are just a few of the hundreds of corporations who have vowed to switch to cage-free eggs in the not-so-distant future. To help with this major industry shift from conventional-caged to cage-free environments, MAFES scientists hope to automate egg collection for those producers looking to make the change. According to United Egg Producers, in 2017, less than 16 percent, or 49.3 million hens, were in a cage-free production environment. To meet growing consumer demand, approximately 70 percent of the nation’s 320 million birds need to be cage-free by 2026. Proponents of the system point to animal welfare as the driver for this change in the table egg industry. And with such large changes looming on the horizon, costs and labor must be considered. Cage-free production systems are far more labor intensive, requiring workers to gather eggs from housing floors. To help resolve the increased labor, Zhao is leading a team of scientists to automate egg collection in the cage-free production system. In addition to agricultural and biological engineers, the work involves scientists in electrical engineering and poultry science. 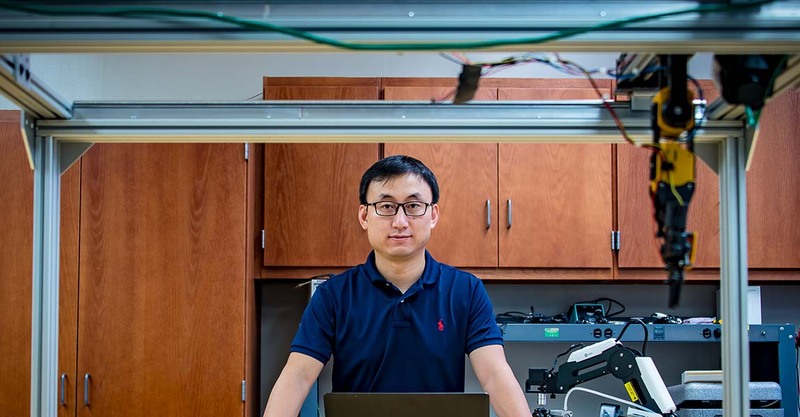 “We are building a robotic car to gather eggs from the floor of the caged-free chicken house and to also train chickens not to lay eggs on the poultry floor,” Zhao said. The autonomous machine is equipped with a robotic arm, and real-time image processing capabilities. While the prototype has been developed, many questions must be answered before the cart is fully-operational, including how the use of the robotic car will affect the laying hen. 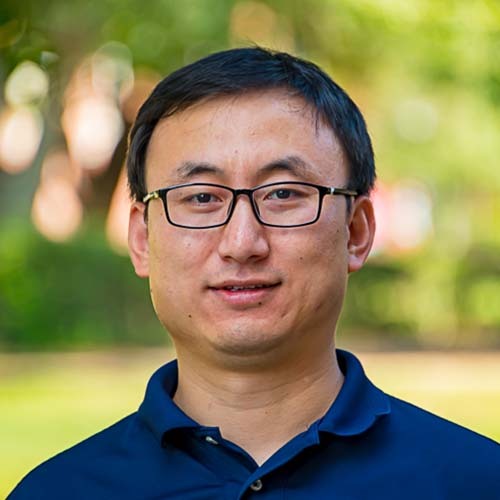 Zhao and his team are studying both white and brown egg-laying hens as part of the project. According to poultry scientists, white and brown hens have different temperaments, thus may interact with robots differently. The study will evaluate the robot performance regarding floor egg reduction in early-peak laying stage, which is a critical period for training good laying habits. A component of the study is to determine if the autonomous car will stress the chickens. 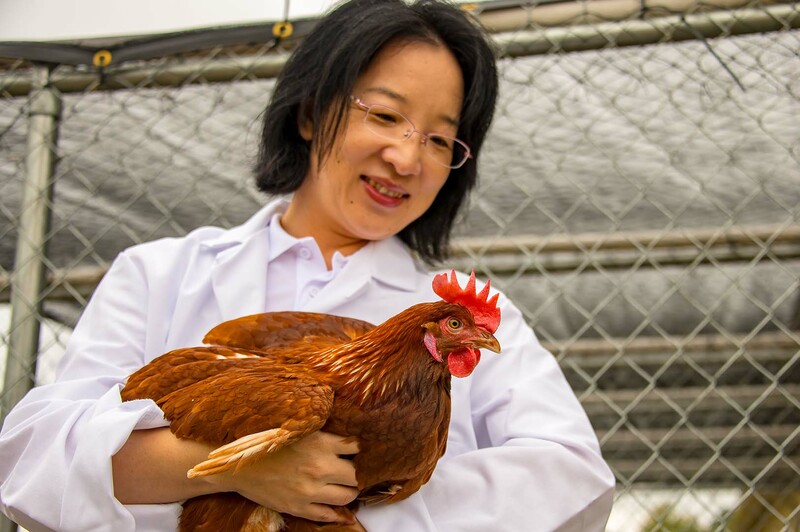 Dr. Wei Zhai, assistant professor in poultry science, will measure stressors in a sample of the study hens. She is looking at both short- and long-term stress. Corticosterone is a hormone released during short-term stress. While it fluctuates daily, it can be an indicator of anxiety in the bird. The H:L ratio, which is the measurement of two types of white-blood cells, is an excellent indicator of long term stress in poultry, Zhai added. “We will take a small sample, similar to a finger prick used to measure sugar in humans,” Zhai said. “We will sample blood at the beginning and end of the two laying stages to determine if the cart is causing stress to the hens,” Zhai said. The blood analysis is only one of the indicators that will be analyzed during the study. Performance of the hen, including egg production, feed consumption, feed conversion, and body weight will also be measured across the study group and control group to determine if changes occur with the presence of the robotic car. Another element of design to be tweaked will be the robotic car’s suitability to run on the bumpy, littered terrain of a poultry house. “First we will run the robot in the laboratory to determine if the robotic arm can find and pick up the egg,” Zhao said. Scientists will run the robotic system periodically in the poultry house to determine how it performs in the litter. They will also test optimal speeds and different time periods to run the vehicle. One thing they hope to deter is chickens laying eggs on the floor. “We hope, by beginning with early layers, the use of the robot will train the chickens to lay in the nest box and not on the floor,” Zhao said. The overarching goal is to help those egg producers who transit to cage-free production systems. 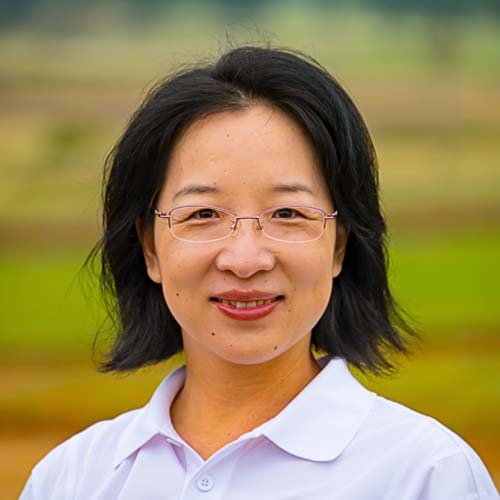 “Our job is to help the poultry industry achieve efficient and sustainable production systems, thereby enhancing their ability to compete in today’s global meat and egg market,” Zhao said. The research is funded by the Mississippi Agricultural and Forestry Experiment Station and the Egg Industry Center. In addition to Mississippi State, scientists with the USDA Agricultural Research Service and Iowa State University are participating in the study. Passion At Work: The mission of my team is to address ever-changing challenges in poultry production through engineering automatic solutions that reduce labor intensity. Passion At Work: My long-term goal is to improve poultry production and benefit consumers with a high quality source of animal protein.